Born in 1867, Henry Lawson’s early days were in the Gulgong area – and some schooling in the district from age 9. About 1880, his father Peter won the contract to build Ryleston Railway Station then came to Mt Victoria as a builder in 1881. Henry followed to help him, aged 14. Peter built houses and the famous ‘School in Montogomery St.’ The headmaster and founder was Mr Reinits, who taught many subjects (with staff) to pupils local & boarders, up to University entry level. Henry was a pupil there – part of a better education that is often claimed. Henry also had family here: Mr Albury (grandfather), whose daughter Louisa Albury/Lawson, the publisher, came to visit (Henry’s mother); Uncle Ernie Albury and brother Peter. Henry had numerous friends, and workmates here and they were active in riding, camping, tramping and socialising at The Imperial Hotel. Like the Gulgong Lawson Museum, perhaps one day there will be a Mt Victoria Lawson Museum. 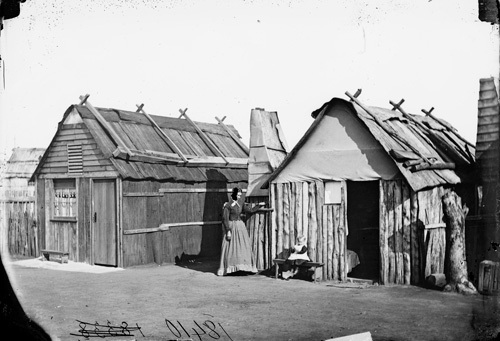 Louisa Lawson & Charles Lawson outside their bark hut, Gulgong, 1870-1875, glassplate negative.